This page is centralizing information about VMware Mirage product. UPDATE: VMware Mirage 5.9.1 has been released. Release notes are here. Core Windows 10 Creators Update (v1703) support: Support added for bare metal provisioning, in-place provisioning, OS migration, hardware migration, restore, revert to snapshot, and apply driver library. Operations not supported include base layer update and rebase, application layer and update. Bare metal provisioning for GPT disk partitions: Support for GPT partitioning (and re-partitioning) on all Windows platforms that support GPT and UEFI boot. Bare metal provisioning support for devices with eMMC and SD disks: Extends provisioning support onto Windows tablets and other devices with embedded disks. Improved support for SSL CRL/OSCP validation: New option to permit SSL connections when under certain CRL/OSCP communication failures, resolving connection issues related to use of Mirage 5.9. Improved MongoDB replica set controls: Fixed replica set membership and arbiter activation issues, especially on uninstallation or upgrade of Management Server node. Improved MongoDB connection handling: Stability fixes with Mirage Management Server establishing and maintaining MongoDB connection. Note that the latest VMware Mirage 5.9 supports Windows 10 including the Anniversary update. Also, It’s possible to migrate Windows 8.1 endpoint to Windows 10, where Windows 7 migrations to W10 were already supported in previous releases. Windows XP reached the end of support a few years back. Worth to mention, that Windows 7 will be the end of extended support January 14, 2020. (mainstream support has stopped January 13, 2015). So it’s just a question of time when desktop systems running on Windows 7 will need to be migrated to Windows 10. (supposing that only a few shops went and migrated to Windows 8.1). VMware Mirage takes some preparation, sizing, architecture planning. You can also, however, build an “all-in-one” POC server to test on few key desktops/laptops within your company. This guide has a different approach, however. We will really build the VMware Mirage cluster the way it should. We Install 2 VMware Mirage management servers to be safe in case of MongoDB corruption. We deploy separate Mirage server (which can handle up to 1500 Endpoints), and we deploy a separate file server which basically stores all the Mirage files, compressed and deduplicated. What is VMware Mirage Driver Library? How to Capture a VMware Mirage Base Layer? How to Capture an App Layer? 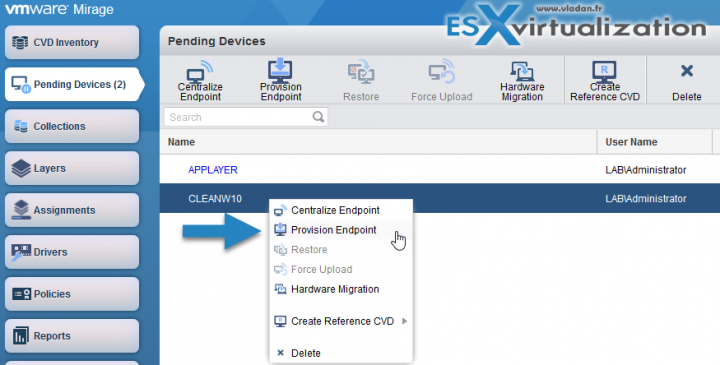 How to Provision a New Endpoint with VMware Mirage Base Layer? How to Apply a VMware Mirage App Layer? How to Enable Branch Reflector on a device or endpoint? – (upcoming post). How to Migrate Windows 7 to Windows 10 using VMware Mirage? Horizon View Advanced or Horizon Enterprise. (ex. 100 licenses of Horizon Advanced entitles you for 100 Mirage Users). VMware Mirage standalone sells in a package of 10 licenses. (or 100 licenses). So if you purchase 1 copy it allows you to manage 10 endpoints. The download package has all the necessary software, for x86 r x64 systems, as well as USB creation tools. There is also an option only to license the Windows migration feature. In this case, you’re buying a 6-month term license focused on subscription.